Mouse Guard previews started showing up online a few days after my decision to permanently forgo single issues of comics for their (usually) more affordable trade collections (this was sometime around 2006 or 2007 if memory serves), and those previews made me feel like a freshly-quit ex-smoker walking through a lunchtime huddle of co-workers still on the death sticks. I've never gravitated towards talking animal comics, but the Mouse Guard preview pics immediately drew me in. It looked like the animals from a children's picture book transplanted into Middle Earth. And somehow, rather than appearing silly, the mice in the pictures looked as noble and brave as any of Tolkien's diminutive adventurers. Mouse Guard tempted me to forget my new resolve. Sure, I could wait for the trade, but it wasn't a Marvel or DC book. As far as I knew, there was no guarantee the thing would ever get collected. I'm fairly certain that at that point even Marvel was still fairly selective about what it would reprint in trades and what would be forgotten in quarter bins. Unfortunately, as you might imagine, there have been quite a few books over the years that made my mental "wait for the trade" list. I expect there are, and will continue to be, many victims of this list and Mouse Guard was one of them until I spotted the hardcover edition of Mouse Guard, Vol. 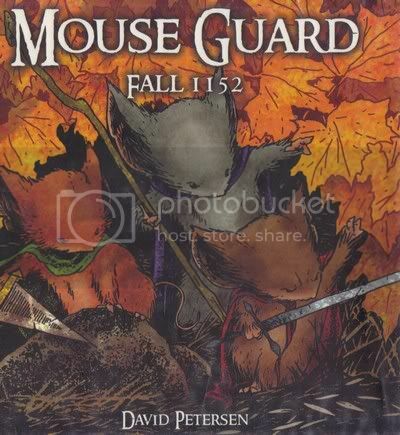 1: Fall 1152 in the library and I suddenly remembered how badly I had wanted to read "the mouse thing with the swords." Mouse Guard introduces its readers to a world where intelligent mice react to the dangers they face - such as the many predators the book's real world counterparts suffer - by carving cities and towns out of tree trunks and creating an elite guard, the book's namesake, to protect their people. In this first collection, the death of a grain merchant reveals a plot to overthrow the mouse government. Mouse guards Saxon, Kenzie, Lieam, and Sadie race to find the mouse traitors and stop them. It's a wonderfully told story. It isn't a particularly complex story, but it's complex enough to keep an adult mind, or mine, engaged. While there are echoes of Tolkien, thankfully whatever inspiration Petersen takes from Lord of the Rings doesn't extend into exposition. We don't need to know the intricate mouse trade negotiations and epic mouse wars that have occurred from the dawn of mouse time until now. They're mice. They have swords. Petersen trusts us enough to let us continue with just that (though the collection does come with maps of the Mouse Territories as well as other extra info). It's also a very well-paced story. While my main motivation for quitting single issue floppies for graphic novel collections was financial, one of the things that made the choice easier easy was how quickly I could get through your average single issue of a superhero comic in the age of decompression. But each single chapter of Mouse Guard was filling. If I had broken my floppy fast for Mouse Guard, I bet I wouldn't have minded too much. It's particularly surprising how well Petersen renders action scenes. As I said, the book looks and feels like a children's picture book, but those swords the mice carry aren't just for show. And when you begin reading it, if you're like me, you will assume one of two things is going to happen. Either the author will avoid any real violence in the story (e.g. lots of sword duels without anyone ever actually getting cut), or the contrast between the violence and the picture book feel of the thing will make it far too grisly (one of the most quietly traumatic moments of my childhood was watching the animated adaptation of Watership Down which, among other things, features quite a few cute little bunnies ripping each other to pieces). But Petersen strikes a wonderful balance here. He doesn't shy from blood, but he doesn't splatter the pages with it. In the meantime his sword fights are some of most dynamic I've seen in comics, regardless of the fact that it's tiny rodents crossing blades. One of the smart choices Petersen makes here is how he draws the mouse guard's predators. Two scenes feature battles between the mice and larger creatures, and what makes the predators look so scary is Petersen's choice to draw them realistically. 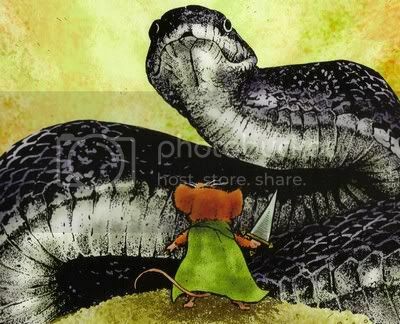 When the mouse guard fights a snake, it looks like a snake. He doesn't exaggerate the renderings at all. If Petersen were asked to draw a snake for a science book for children, you wouldn't expect a rendering any more realistic or specific. And somehow that makes the snake scarier than the kind of cartoon monsters any comic book reader is used to. If I have any complaints with the book, they're minor. I occasionally had difficulty remembering which mouse was which, because for the most part the different heroes are distinguishable only by their different colored fur and capes, but it was never enough to derail my immersion. Overall, a wonderful book that I would recommend to just about anyone. Upon finishing it, I was psyched to learn the property has spawned two new series: Mouse Guard, Vol. 2: Winter 1152 and the anthology series still being released in single issue form, Legends of the Guard. By the way, while I'm not really comfortable giving people advice about what is and isn't appropriate for children I don't have the responsibility of raising, I think it's fair to say if you're comfortable with your kids seeing Avatar, Peter Jackson's Lord of the Rings adaptations, or just about any live-action Marvel Comics or DC Comics adaptation, I doubt you would have a problem with your kids reading Mouse Guard.